The question may have occurred to someone who has been reading my Chasing Ghosts posts: why would a blog that is mainly about progressive ideas and the culture of the Deep South include a series of descriptive pieces about the writer’s family history? Chasing Ghosts is not only about finding the bald facts of strands of parents and children that eventually resulted in me. No, for me, being a part of the Deep South is not socio-political; it’s personal. The Dickson family – my branch of it – migrated from the Carolinas to Georgia and finally into Alabama during a period from the mid-1700s through the mid-1800s. We have lived in Alabama for more than 150 years. I have seen census records from the 1850s that show my great-great-great grandfather David Madison Dickson (1811-1877) owning a homestead less than twenty miles from where I live now, having come over from Troup County, Georgia in the 1850s. There is also a family myth, which I read in a book in the Alabama Dept. of Archives & History, that Margaret Mitchell’s Gone with the Wind is based on Dicksons, who were the plantation owners that she knew where she grew up. 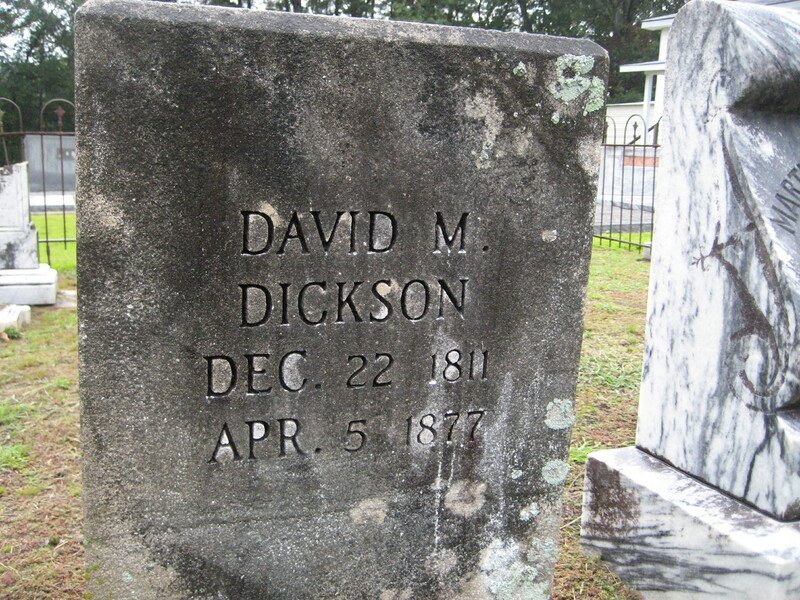 Back further than them, my great-great-great-great-great grandfather David “Long Pat” Dickson (1750 – 1830) was a hell-on-horseback patriot in Georgia during the Revolutionary War and later a member of Georgia’s state senate during the early years. In terms of the Deep South’s culture, these and others among my forebears were among the men and women who forged the regional identity, across South Carolina, Georgia, Alabama and Mississippi. Yet, I also know about the dark side of my lineage. Prior to the Civil War, my ancestors owned slaves in both Georgia and Alabama. Within Southern history, the Deep South was known as the worst place that a slave could end up. So when I see depictions of slavery in films like Django Unchained and 12 Years a Slave, or when I work with stories like August Wilson’s Piano Lesson, I can’t turn away and say, That has nothing to do with me . . . because it does. This study of my own personal micro-history occurs within my broader interest in the Deep South. My writing and editing work that has consisted of research, reading, traveling, interviewing and writing has helped me to understand the realities of the Deep South, of my home state of Alabama and of my hometown of Montgomery. The work that I am doing in the Chasing Ghosts project is helping me to understand who I am within this context, as I traverse my family history. My persistent engagement with regional history and issues has led me to many insights about the Deep South’s social, political, cultural, and artistic realities. I love learning more and more about this region, and I don’t suffer from the misconception that the Deep South’s culture can be reduced to college football games, Southern Baptist tent revivals, racist violence, and mysterious backwoods antics. The Deep South is an incredibly complex and darkly ornate sum-total of many paradoxes, a place simultaneously vicious and sweet. Quite frankly, my family is part of that. I have a lot of pride in my Deep Southern heritage. I wouldn’t want to be from anywhere else. Sadly, the phrases “Southern pride” and “Southern heritage” have been hijacked as blanket-terms for stubborn pro-Confederacy sentiments that, honestly, many Southerners don’t share. By contrast, many of us take pride in being Deep Southerners, despite our lurid history, despite our present difficulties, and despite how we are characterized by outsiders, media programming, and news pundits. I would have anyone know that, as a progressive-minded, well-educated life-long Alabamian, I made a conscious choice to reject many common socio-political features that gain prevalent attention here: racism, homophobia, xenophobia, economic elitism, and attempted isolationism. So have a lot of others here. My Southern pride comes not from that tradition but from an awareness of my family’s extensive roots here, from having seen firsthand much of the region’s fervent and lively natural beauty, and from an engagement with our extraordinary culture that has made major contributions in the areas of music, literature, art, and food. While I am ever-cognizant of the historic shame our culture has brought on our region and of our current social, political, and economic quagmires, I stay in the Deep South because I am also invested in the wonderful features of the land and people here. Unlike backward-looking, myth-centered proclamations of “Southern pride,” my faith and attention are focused on what we rightly ought to take stock in, while still making the effort to surmount the entrenched inequalities in the areas of social justice and education, which are the roots of the region’s downsides. If anyone has a stake in making the Deep South a better place, I do. My family has been in the Deep South for more than 250 years, and in the state of Alabama for more than 150. And for me to stay in this region I have had to answer the quandary that nonconformist Deep Southerners have to face: if you’re going to reject the norms of the Deep South, what will you accept in their place? Reducing the Deep South to an either-or paradigm – to a decision: take it or leave it? – is the wrong approach. And to blindly and simply reject the region’s most conservative often violently closed-minded ideals seems to me as trivial an act as accepting those ideals without question. Too many disgruntled Deep Southerners cast off “Southern pride” and replace it with a heart full of disdain, anger and resentment toward the region. (During my younger years, I did that, I’ll admit.) Some people move far away and either shamefully cover up their roots or disparage their home region from afar. Are these people often correct in their criticisms? Yes. But I feel sorry for those “haters” for two reasons: they clearly feel too overwhelmed or defeated by the troublesome side of the Deep South to stand up against it, and they can’t find any beauty or value in the whole region because they can’t get past the socio-political problems. The Deep South is a case study in what can go well and what can go badly in a multicultural society. As a self-proclaimed multiculturalist, I cling steadfastly to the belief that unlike cultures can co-exist in a peaceful and mutually beneficial way, if the people within those cultures make the effort to understand each other, tolerate difference and be fair to one another. Down here, our great triumphs (music, food) have come from unions of diverse cultures, and our immense regrets (slavery, Jim Crow) stem from an awful mishandling of difference. Understanding “the Other” is one aspect of changing the Deep Southern culture for the better— but we first must understand ourselves in honest ways. How can we dialogue with people unlike ourselves, if we don’t even know who we are? Chasing Ghosts is one way that I am trying to understand who I am, past and present, in order to face the future more effectively. Make no mistakes about what I am saying: my Southern pride is not based on any manufactured mythology of “Lost Cause” glory. Mine is based on an honesty derived from researching the truth. On the bright side, I have traveled around and seen the beauty, both natural and manmade, and I have experienced the people, full of life and creativity. On the dark side, I know about the inequality and the injustice. I also know that my forebears owned slaves, and I am deeply sorry that they participated in a practice so horribly inhumane. But I’m honest about it, I don’t find it charming, and I can’t change the past. But I can be a part of trying to change the present and the future for the better. That’s where knowing the truth becomes useful. I would encourage anyone living in the Deep South to do what I’m doing here: find out about your families, look into the people you came from, compare your own personal myths to the real history. My dad took on the near-Herculean task of assembling my family history back in the 1980s, but today, with the internet full of digitized records and e-mail to correspond with others looking for the same things, it’s much, much easier than ever to chase ghosts. I’m certain I’ve said this in a comment before, but I, too, am descended from David Madison Dickson. My great grandmother was Mary Tallulah Dickson from Pine Level, AL. She was the daughter of Jesse Hamilton Dickson and the granddaughter of David Madison Dickson. This was an excellent article and it struck a chord with me. I first took note of your blog when you wrote about John Asa Rogers of Forest Home, Alabama, who was my great-grandfather. The issues you address are quite familiar to me and have engendered much pride and consternation. Even though I no longer live in Mississippi, where I grew up, I still consider myself a Southerner and still struggle with that legacy. All of my family are gone from Hattiesburg now, either to cemeteries or other parts of the country, but part of me never left, and never will. Your work has stimulated much thought and much self-awareness. Keep it up; you are doing a fine thing.